David C. Jiles, Palmer Endowed Chair in the Department of Electrical and Computer Engineering at Iowa State, has been elected to the Royal Academy of Engineering, the United Kingdom’s national academy for engineering. Jiles is the ECpE department’s first RAE Fellow. He was cited for his seminal contributions to the scientific understanding and engineering applications of magnetism. This has encompassed power, aerospace, automotive and medical engineering. His most influential work – the development of a model for non-linear magnetic hysteresis – is the internationally accepted standard and has been widely cited. 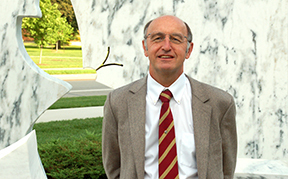 Jiles, an Anson Marston Distinguished Professor, has chaired the ECpE department since 2010. He is a Fellow of several societies including the American Physical Society, the Institute of Electrical and Electronics Engineers, the Magnetics Society, the Institution of Electrical Engineers (UK), the Institute of Physics (UK), the Institute of Materials, Minerals and Mining (UK), and the Institute of Mathematics and its Applications (UK) and an Honorary Fellow of the Indian Society for Nondestructive Testing and a member of many more professional and scientific societies. He earned a DSc from the University of Birmingham (1990), a PhD from the University of Hull (1979), an MS from the University of Birmingham (1976), and a BS from the University of Exeter (1975). Jiles arrived in Ames in 1984 as a research fellow at the Ames Laboratory and became a professor of electrical & computer engineering and materials science & engineering in 1990. He attained the rank of Anson Marston Distinguished Professor in 2003. He was Director of the Wolfson Centre for Magnetics at Cardiff University from 2005 until 2010. He was then appointed the first Palmer Endowed Department Chair in Electrical & Computer Engineering in 2010. Jiles’ research interests include nonlinear and hysteretic behavior of magnetic materials; magnetoelasticity, magnetostriction, and magnetomechanical effects ; nondestructive evaluation; and transcranial magnetic stimulation (TMS) for the treatment of brain disorders – among other areas. His model for non-linear magnetic hysteresis is the internationally-accepted standard and his research into TMS has uncovered the potential for new treatments of a number of brain diseases. He holds a courtesy appointment with the Department of Materials Science & Engineering and is an Associate of the U.S. Department of Energy’s Ames Laboratory. Election to the Academy is by invitation only; about 50 Fellows are elected each year by peer review from nominations made by existing Fellows. They are distinguished by the title “Fellow of the Royal Academy of Engineering” and the post nominal FREng. Jiles is the ECpE department’s first RAE Fellow and fourth fellow of a national academy of engineering. Paul M. Anderson (BSEE ’49; MSEE ’58; PhDEE ’61), Aziz Fouad (PhDEE ’65), and Vijay Vittal (PhDEE ’82) are ECpE faculty who have been elected to the United States National Academy of Engineering (NAE).